Why, in the world, does my faith matter? That is the question keynote speaker Rev. 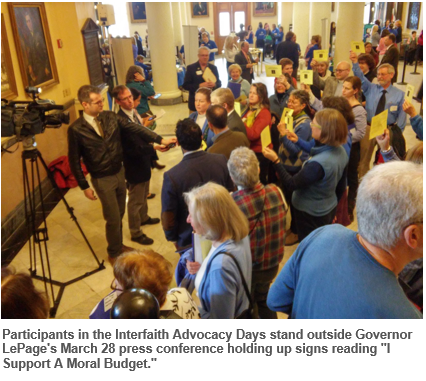 Dr. Bill Barter asked 130 people of faith who gathered in Augusta on March 27 and 28 for Interfaith Advocacy Days. I have added the commas to his question to emphasize the beauty and power of his double entendre: “Why in the world?” is a question that asks, almost in exasperation, if there is any reason on earth that faith matters at all. “Why, in the world, does my faith matter?” asks about the places where faith collides with real-world issues like hunger, poverty, climate justice, health care, and homelessness. 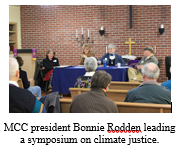 Both questions were asked—and answered—during this powerfully inspirational two-day symposium hosted by Maine Council of Churches, Maine Episcopal Network for Justice, and Preble Street Faith Action Network and co-sponsored by Capital Area Multifaith Association, Faith Linking In Action-Bangor, Maine Unitarian Universalist State Advocacy Network, and Winthrop Area Ministerial Association. As we move forward together in the days ahead, looking for how, in the world, our faith matters, we will testify about policies affecting the poor, the outcast, the stranger, those without hope, those without a voice, and we will do so as a profession of our faith. During the opening worship service on March 27, we prayed that God might bless us “with enough foolishness to believe that we can make a difference in the world, so that we can do what others claim cannot be done.” Having witnessed the faith and dedication of all those who participated in this transformational event, I am convinced that we have, indeed, been blessed, blessed and called by God to this holy work of seeking common ground and working for the common good. I pray that you will join us.